Many otherwise capable, confident, and knowledgeable people balk when it comes to public speaking. In fact, a poll a few years ago found that Americans are more afraid of public speaking than they are of dying. Kelly Libatique, author of A Toast to the Holy Ghost? A Dispassionate Look at Alcohol and the Bible, transfers his expertise in public speaking to readers in his book Divine Knowledge Transfer: Applying Biblical Principles to Communicating, Public Speaking, Educating, and Overall Living. Libatique’s book is the first of its kind, combining Biblical concepts with modern day communicating and public speaking. His advice is easy-to-understand, easy-to-implement, approachable, and straightforward. 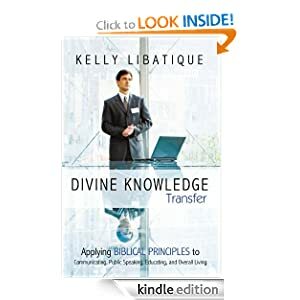 Divine Knowledge Transfer is filled with validating stories and a wealth of advice the Bible offers on how to relate and communicate with others and how to prepare for difficult circumstances and people. Fear of public speaking is normal and will never completely go away. Instead of fighting, you can learn to utilize it. Preparation is key in controlling fearing the unexpected and that dread of feeling vulnerable and out of control. Your appearance says volumes about you and causes audiences to make judgments about you in just seconds. Distractions are inevitable. Don’t try to avoid them, instead be prepared for what can and will happen. As well, distractions can actually be used to make you look more professional. Your public speaking needs to be about the audience—their needs and desires—not yours. Libatique offers readers the empowering message that anyone can become better at communicating to audiences by learning basic techniques, avoiding simple mistakes that make experts look like amateurs, and cultivating the simple techniques that make amateurs look like old pros. Readers from all walks of life, whether they are preachers, teachers, or public speakers will benefit from Libatique’s words and become better at what they do by being able to communicate effectively and get a message across.